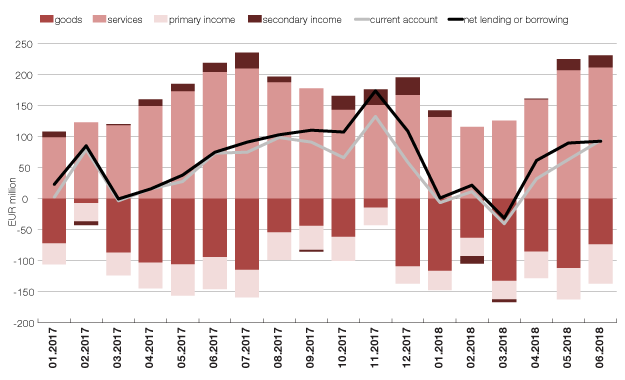 The flash estimate1 put the Estonian current account at 94 million euros in surplus in June 2018. The surplus on the goods and services account increased by a quarter from a year earlier to 139 million euros. Goods exports were up by 11% over the year and imports by 8%, meaning the deficit on the goods account was 20 million euros narrower than in June 2017 at 74 million euros. The surplus on the services account is typically large in the summer months and it stood at 212 million euros. Both exports and imports of services were up 4% over the year. The net outflow of investment income and current transfers, or the primary and secondary income accounts, increased by 7 million euros to 45 million euros. The current and capital accounts were in surplus by a total of 93 million euros, meaning that the Estonian economy was a net lender to the rest of the world, so the country as a whole invested more financial assets abroad than it received from there.